The incident has led to further calls for protective netting to be introduced throughout the MLB. The child is carried out of the ground. A CHILD WAS hospitalised after being struck by a 105 mph foul ball at Yankee Stadium, the latest in a series of incidents that have led to calls for more protection for spectators in Major League Baseball. Play in New York’s home game with the Minnesota Twins was held up for several minutes after Todd Frazier’s hit flew down the third-base line and into the crowd, striking the young girl. The girl was given first aid at the stadium before being taken to an area hospital, the Yankees said in a statement. “The child who was struck with a batted ball today was given first aid at the ballpark and is receiving medical attention at an area hospital,” the Yankees said, noting that federal laws prevented them from providing further information. Several players were left visibly distraught as the young girl received treatment. “I saw the whole thing,” said Frazier, who had knelt with his head bowed as play was held up. It is the latest of several incidents of fans being struck at Yankee Stadium. 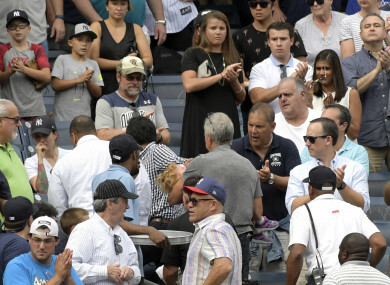 A male fan was left needing medical attention in July after being hit by a foul ball from Aaron Judge while a young boy was left bloodied when being hit by debris from a broken bat in May. The Yankees said in August they were studying the possibility of extending protective netting following the incidents. “The Yankees are seriously exploring extending the netting prior to the 2018 season to the outside of the Yankees’ dugout and the outside of the visitors’ dugout, with the height of the netting being reduced as it approaches the dugouts,” the team said in a statement. Major League Baseball does not have a timetable for installation of protective netting at all 30 major league stadiums, with commissioner Rob Manfred noting that the different designs of each stadium make it difficult to implement. “We continually are talking to the individual clubs about what they should be doing in each of their stadiums,” Manfred said last month. But New York’s CC Sabathia said his mind was made up after Wednesday’s incident. Email “Toddler hospitalised after being struck by 105 mph baseball at Yankees game ”. Feedback on “Toddler hospitalised after being struck by 105 mph baseball at Yankees game ”.